The 2019 Easton Ghost X Evolution (Evo) is the next generation of Easton Ghost X in the USA and USSSA (Big Barrel) bat space. (If you are looking for this bat in BBCOR then check out the 2019 Easton ADV Project 3.) We’ve hit with the USSSA and USA versions of the bat. The USSSA version correlates well with 2018 Easton Gh… Jump to the full review. We aren’t the only ones to have information about the Ghost X Evolution. Other places, in particular those who sell bats, usually have a boiler plate write up on the specs of a bat. Many of those we reference to make sure we are seeing what we should be. Here are some more references for the 2019 Easton Ghost X Evolution review. (If you are looking for this bat in BBCOR then check out the 2019 Easton ADV Project 3.) We’ve hit with the USSSA and USA versions of the bat. The USSSA version correlates well with 2018 Easton Ghost X. It’s smooth, big barreled and will be loved by serious travel type players. But, we found the USA Ghost X Evolution leaps and bounds better than the 2018 USA Ghost. The 2019 bat feels smooth, the barrel is huge and the balance right where you want it. It’s sting dampeingin was on par with the USSSA version—not like the electrocution feeling found in the 2018 USA Ghost x. We expect the 2019 Easton Evo to be a favorite this year in the USA Space. The USA Version of the bat, mind you, only comes in a drop 10. It swings light, has a good sized barrel and we believe is leaps and bounds above last year’s model that we just couldn’t like no matter how hard we tried. This bat is for those in the USA space that are: Are serious about baseball; Don’t have a budget; Want Easton’s best offering in the USSSA or USA Space; Prefer two piece composites; Want a light swinging bat. In terms of who the bat is made for, it fits the same category as the 2018 Easton Ghost X. That is, a light swinging two piece composite with a big barrel and a smooth smash. The bat comes in a USSSA (Big Barrel) and a USA Bat so, of course, would only be useful for that type of player. In the USA Bat space you can be confident the Evolution is considerably different between the 2019 Evolution and the 2018 Ghost X. Speak to any player that swung the USA Ghost X in 2018 and you'll find the bat had some problems. Not only was one bat banned for being illegal, but the bat felt really, really terrible on mishits. Compared to the 2017 Easton MAKO the bat felt like it was built with an electric shock mechanism for poorly hit balls. Exit speeds were less than steller too. Whatever Easton did between 2018 and 2019 with their top end USA Bat worked. The new Ghost Evolution feels smooth, sounds great and has that same light balance to the swing. (They did add some type of foam to the inside of their CXN connective piece. If this was the ticket that caused the change we aren't sure, but there is clearly something different in the feel between 2018 and 2019 in the USA space). The new 2019 Ghost X Evolution has an upgraded foam inside the barrel. This helps dampen sting (especially in the Hyperlite). It is also the company that secured the Lizard Skin grip contract away from Slugger as well as a new end cap that is a bit lighter---helping to bring down the swing weight as the foam increased it. Easton's flagship baseball bat line for 2018 is the Easton Ghost X. The Mako is no longer. We have watched players swing the new Ghost X at length. We have spent a lot of time over the last several weeks getting ready for this review. The 2016 Easton MAKO is a two piece composite bat built with an extremely light swing weight. It is the lightest swing Easton makes and one of the lightest swinging bats on the market. After almost 5 years of experience with the 2015 Easton Mako we have more than a few things to say. The two piece composite space is replete with serious options. DeMarini’s CF Zen, Rawlings Quatro, Louisville Slugger’s 919 Prime and Mizuno’s Hot Metal, to name just a few. Each of these bats focus on a big barrel, light swing and smooth smash on both hits and mishits. As well, especially the 919, Zen and Quatro, these bats come in an array of sizes and leagues. Expect a serious USSSA and USA bat in each of these options. You’ll find evangelists for each depending on experience with the brand or just a general preference for a sound. Easton has a ton of success in the Youth USSSA market (helped by the LLWS and a great bat for ages in the market). In the last few years they’ve come on strong with the drop 5 in the Ghost. Rawlings looks to improve upon the durability of their flagship bat with the 2019 Rawlings Quatro Pro. 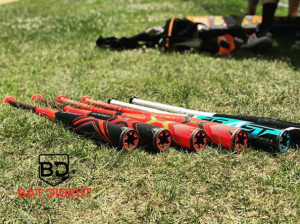 The BBCOR version of the bat was our favorite bbcor bat in 2018. We have hit with the BBCOR, Drop 5, Drop 8 and Drop 10 2019 DeMarini CF Zen. The bat rakes. Plain and simple. After a couple hundred hits with the 2019 Slugger Meta 9 Prime BBCOR bat we have some recommendations. We think it one of the best BBCOR bats on the market. The 2019 Easton Evolution is a high end two piece composite bat built after the manner of the Easton MAKO of years gone by. They have claimed to upgrade a few things including the handle and barrel. But, anyone who ever swung those old Mako’s knows they needed no upgrading. The question is, of course, can they replicate those 2 1/4 inch monsters in the USA and USSSA space. In the USSSA expect a drop 10, 8 and 5 in a 2 3/4 barrel. You can also find a 2 5/8 drop 10—which we think is just a left over barrel from the 2017 season as no league requiring 2 5/8 barrel is also allowing the USSSA stamp anymore. All of them have left to the USA Standard. These bats use a white and black theme. In the USA Space expect, also, a drop 10, 8 and 5. These bats use a black and neon orange theme. Depends on what you want, but in terms of straight exit speed tests we like the Zen. However, the Evolution is a legit option in terms of long term durability and performance. Both swing about the same and feel about the same. We personally like the Zens a bit better—but there are sizes and drops where we might prefer the Ghost X Evolution too.